KUWAIT CITY -- After a warming-up on Wednesday when China wrapped up all the four gold medals, Chinese sharpshooters continued sweeping the shooting ranges here on Thursday with their record breaking and equaling shows to bag nine of the ten golds. 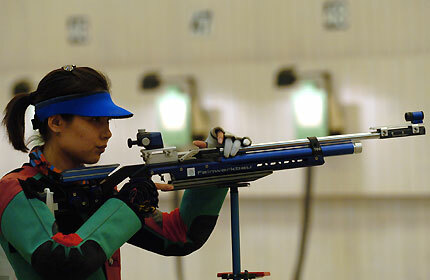 Markswomen grabbed the gold of 10-meter air rifle team event with a record-smashing 1,196 points, two points ahead of the previous world record set by Chinese team as well in the 2002 Busan Asian Games. The team was composed of Olympic gold medalist, world record holder of women's 10-meter air rifle Du Li, champion of the World Cup Bangkok and Guangzhou forts Zhao Yinghui and gold medalist of the 50-meter rifle three positions at the 2005 World Cup Finals Wu Liuxi. Du and Zhao both scored 399 points in the qualification round and Wu collected 398. In the ten-shot final, the 25-year-old Du, who is ranked world No. 1 of the discipline, stunned the audiences by hitting the bullseyes with all of the first nine shots above 10 points, including six above 10.6. Although, after a failure of the electronic screen which begot a small fuss, she finished her performance with a 9.3 point, her 1st position seemed unshakable. Du said she was regretful at the result. "I thought I was going to break the world record and suddenly felt nervous," said Du with low voice as her head drooped, "I had been aiming too long before making the shot." The girl from east China's Shandong Province, who created the world record at the 2003 Croatia World Cup with a staggering 104.9 points, was always the last of the eight finalists to open fire. In the last shot, she needed only a 10.6 point, a score seemed easy to her, to renew the record. Du's teammate Zhang Yi might have renewed the world record as well, had the record still been renewable. Zhang, 21, who carved out in the 2006 World Championships by pocketing junior gold of women's 10-meter air rifle, equaled junior world record with 400 points, or the full points, in the qualification round. The junior record, set by South Korean shooter Seo Sun Hwa in World Cup Sydney Fort, was the same as the world record shared by Chinese markswomen Du Li, Zhao Yinghui and Wu Liuxi together with some others from South Korea, Australia, Germany, Russia and India. Chinese teenage shooter Li Peijing clinched a silver with 497.8 points. In men's events, Xu Kun added another gold of men's 50-meter pistol with 662.3 points, and teenage shooters Yan Hang and Mai Jiajie split gold and silver in the junior competition of the event. Thanks to their performances, all five team golds were pocketed by Chinese team. The only gold medal Chinese lost today was the one for women's trap, in which China's Chen Li, champion of the Doha Asian Games last year, marched into the final with a leading 65 hits, but yielded to Kazakhstan markswoman Elena Struchaeva to finish the sixth. Good or bad, the scores "only belonged to a single event," said Wang Yifu, head coach of the Chinese national shooting team, "they should maintain the sharpness in the following competitions."